Wonton wrappers are essential to making appetizers like egg rolls and dumplings. Did you know you that they are incredibly easy to make at home? Make a big batch of our recipe, and use them to make egg rolls, wontons, dumplings, ravioli (yes, ravioli! ), and more! 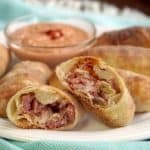 You’ve probably encountered wonton wrappers in their fried-to-perfection form holding in the tasty cabbage and pork stuffing of an egg roll or the creamy filling of a crab rangoon. You may have even encountered the paper-thin wrappers in the produce section of your grocery store (typically found by the bean sprouts and tofu). Maybe you’ve even picked up a package to make your own egg rolls or mozzarella sticks. But, did you know that those paper thin wrappers are actually quite easy to make at home? 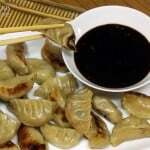 Wonton, egg roll, dumpling, or gyoza wrappers all start from the same basic dough. 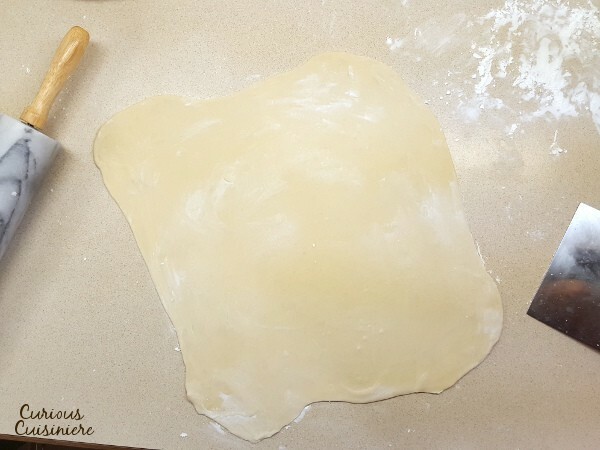 The size (big for egg rolls, small for wontons) and shape (round or square) that you cut the dough will be determined by what you are using the dough for. 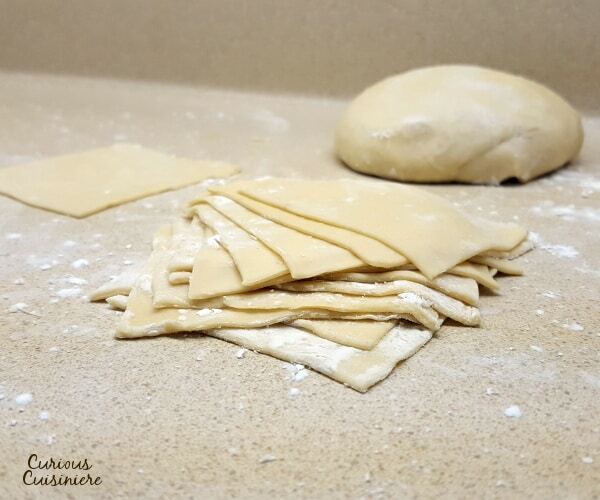 While the dough for wonton wrappers is easy to make, you will give your arms a bit of a workout with the rolling pin, since it needs to be rolled nice and thin for the perfect wonton wrappers. We like to roll 5-10 strokes and then flip the dough over, roll 5-10 more, flip, etc. The dough will contract when you flip it, but flipping helps make sure that the dough isn’t sticking to the counter. If you are having trouble getting your wonton wrapper dough as thin as you want it, here’s a trick. Roll it part way and then cover it with a tea towel to let the gluten relax for 5 minutes. Then, try rolling it out again. If you are one of those lucky people who has a pasta roller, this would be the perfect time to break it out. Using a pasta roller is a great, easy way to get your wonton dough to the perfect consistency. We don’t have one though, and it’s never stopped us from making our own wonton wrappers! When rolling out dough, it is habit to reach for the flour to keep it from sticking to the counter. Right? Not with wonton wrappers! We can’t say it enough. DON’T DUST YOUR COUNTER WITH FLOUR when rolling out the wonton wrappers. Extra flour will make the wonton wrappers tough and gummy. So, instead, we use cornstarch. Cornstarch will not be absorbed as it coats the dough, creating the perfect non-stick barrier. We prefer to use our wonton wrappers right when we make them. We find that the dough is easiest to use when it is fresh. We still make a big batch of wonton wrappers, but then make our potstickers, egg rolls, etc. Then we’ll freeze those for later. It’s so nice to have a bag full of egg rolls in the freezer that you can just pop one our two out when you crave them! That being said, we have frozen the wonton wrappers themselves, and it’s definitely a route you can go if you want to save them to use later. Simply stack the cut wonton wrapper squares with a very generous dusting of cornstarch between them. A good amount of cornstarch between each wrapper is key to being able to separate the wrappers when you want to use them later! The homemade wonton wrappers will keep for 2-3 months in an airtight container in the freezer. Simply thaw them overnight in the refrigerator before using. 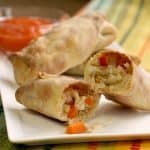 One of our favorite uses for wonton wrappers is our Baked Vegetable Egg Rolls! 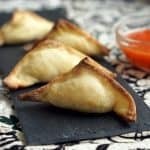 There are so many fun uses for wonton wrappers, even outside of the classic Asian treats. 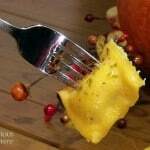 You can even use them as pasta to make ravioli! 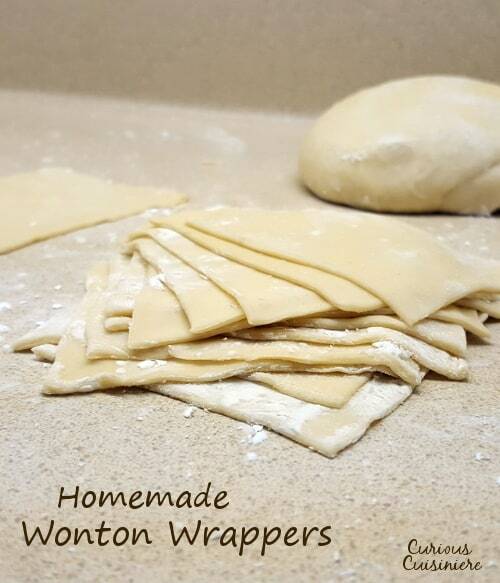 So, the next time you’re craving crispy egg rolls or a big bowl of wonton soup, grab a bowl and your rolling pin, and try your hand at making your own wonton wrappers! 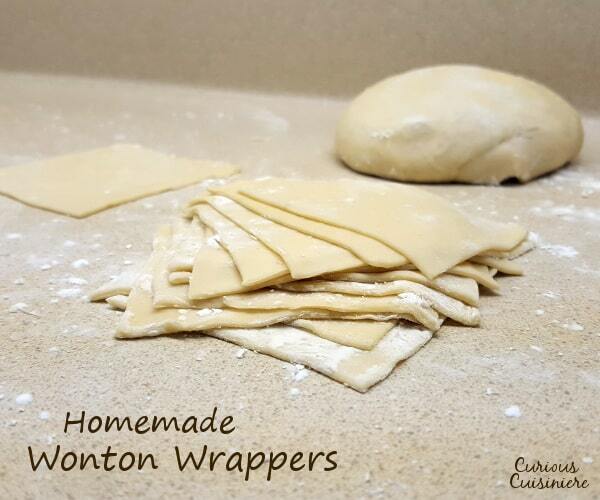 Wonton wrappers are fun and easy to make at home. 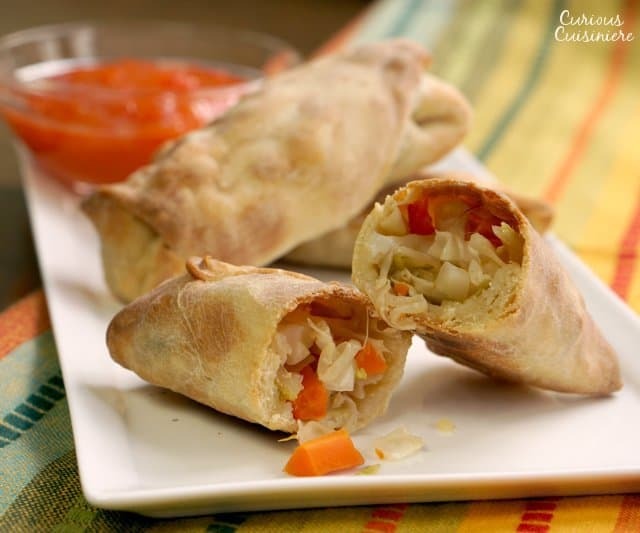 Make a big batch and use them to make egg rolls, wontons, dumplings, ravioli, and more! Place flour into a large bowl. In a separate bowl, whisk together egg, salt, and water. Create a well in the center of the flour and pour in the wet ingredients. Mix everything together with a spoon (or your hands), until the mixture begins to come together. Divide the dough in half. Cover one half of the dough with your towel. Lightly dust your counter-top with cornstarch (NOT flour), and roll half of the dough as thin as you can, aiming for a rectangle roughly 20”x10” if you are cutting 5" wrappers, or 15"x9" if you are cutting 3" wrappers. Use the wonton wrappers immediately or freeze them below (see below). To Freeze for Later: Homemade Wonton Wrappers can be made ahead of time and frozen. Simply stack the wrappers with a VERY generous dusting of cornstarch between each wrapper. Wrap the stack in plastic wrap and store it in an airtight container for 2-3 months. Thaw the wrappers overnight in the fridge before using. How do you make the dumpling wrappers not separate from the meat filling while steaming these? Hi Marietts. When you use the dumpling wrappers, you need to make sure they are sealed tightly around the filling. We do this by moistening the sealing edges lightly with water. This helps the wrappers to get a bit sticky and seal better. Enjoy! Does it have to be un-bleached flour and if so why can’t bleached flour be used? Hi Eva. You could use bleached all-purpose flour. We just prefer to use unbleached because of the chemical agents they use in the bleaching process. Enjoy! So glad you’re enjoying the wonton wrappers! A pasta roller is perfect for making these! Great recipe, I learned a few things doing it. The dough was a little soft for the pasta maker so I kneaded in more flour. When using a pasta maker don’t use any corn starch untill the sheet is the right thickness or it won’t roll thin. Once it’s the right thickness dust liberally and nothing sticks. I let the stacked squares sit for a couple hours and no sticking. Great tips! Thanks Chuck! So glad you enjoyed the recipe! Going to make Thanksgiving Egg Rolls!! My dough is resting, fingers crossed it all works out!! That sounds so tasty! We hope they turned out wonderful! This is a great easy recipe! I actually made it in my stand mixer with the dough hook. I made a well in the flour, added the wet ingredients, then mixed it on a 1 until everything was combined. Then I “kneeded” it on a 2 for three minutes. I don’t think I’ll ever buy premade wontons again. Thanks for the great recipe!! We’re so glad you enjoyed the wrappers Kristen! Thanks for sharing your tips! Made these for my Chinese themed Birthday party…. I used 2 cups sifted white SPELT flour as I am gluten intollorant.. I followed the recipe exactly, the dough was a little sticky after I let is sit for the hour, but using some corn starch solved this. I rolled slightly int a rectangle and then used my Kitchaid pasta attachment. I ran the dough thru the first two settings twice and the third once. I dusted generously with corn starch and then using my quilting ruler, cut with my pizza cutter each 1/4 of rolled dough into 8 3 1/2 in ch squares. I made certain that each square had a good corn starch dusting and wrapped the stacks of eight in between wax paper and into a zip bag to cool. I fried up a wedge of off cut dough, light bubbles and delicious! ! Awesome recipe. the site will not let me tap the fifth star this is a 5 star!!! Thank you for your comments Maggie! It’s good to hear that this recipe works well with Spelt flour too. I’m sure many of our readers will be excited to hear this! We’re so glad you enjoyed the wrappers!. A very Happy Birthday to you as well! I’m wondering whether this would work with whole grain spelt flour and not sifted? Hi Janet. Unfortunately, we don’t have much experience working with spelt flour, so we can’t speak to if it would work well for these wrappers. If you do give it a try, please come back and let us know how it turns out for you! Spelt isnt gluten free. If you can eat it without any reaction, you probably have a fructan intolerance instead. Observing a person’s reaction to spelt is actually one of the best ways to determine a fructan vs gluten intolerance. I tried rolling the dough in the pasta machine and wow it stuck. So rolled out by hand and used. I did add 2 egg yolks to the mix ing process what I had could have been why dough was so sticky.? Will make another time with just one. Hi Dianne, Adding the extra egg yolk without adding more flour would indeed make the dough sticky. Hopefully you get the chance to try it again! Hi Glenda. 2 cups of unbleached all purpose flour is roughly 8 1/2 oz or 240g. 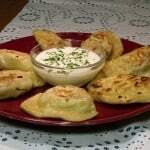 There are commercial egg replacers that can be added to traditional dough recipes. They work well. We have a egg allergy too. Thanks so much for sharing Rita! Allergic to eggs and diabetic. 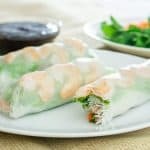 Any ideas for egg and wheat free wonton wraps? I can occasionally find egg-free wrappers at a specialty stores but still fight the wheat content. Thanks. Hi Marilyn. Thanks for your question. Unfortunately, we don’t have a good answer for you. We’re not particularly familiar with how alternative flours would work for these wrappers, and, as far as we can tell, the egg is pretty crucial to the texture. Maybe another reader can help you out. Good luck with your search! 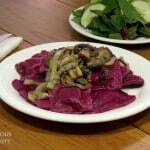 can rice flour be substituted? Hi Linda. Thanks for your question. We’re not particularly familiar with working with rice flour, so we’re not comfortable recommending making the substitution in this recipe. However, if you do decide to give it a try for a small batch, please pop back by and let us know how it turned out for you. That way others can benefit from your experience! A really easy way to roll dough real thin is to put it between two pieces of cling film ( clear food wrap). It never sticks to your worktop, and it is so easy to handle. That is a great idea! Thanks Steven!